Sedum (SEE-dum) commonly known as “Stonecrop” or “spreading Stonecrop”, is a flowering perennial succulent belonging to the Crassulaceae (krass-yoo-LAY-see-ee) family. There are over 400 different Sedum plant varieties. One sedum variety many know is the Donkey Tail (Sedum morganianum). These easy-care, low-water plants are found in the Northern Hemisphere, but some members are native to South America and Africa. Growth and spread of Sedum plants vary significantly from species to species. The low growing sedum plants may spread several feet but only grow a few inches high. Upright varieties may grow as tall as 3′ feet and may need from 6″ inches to 2′ feet of surrounding area to grow and spread freely. Check the specifics of the variety you choose to be sure to provide enough space and headroom. Generally speaking, Sedum flowers are five-petaled and star-shaped. The plant’s growing and bloom time stretches from early spring through late summer and into mid-autumn, depending upon the species. Flowers range in color from white to intense purple. Flowers are generally lightly scented and are quite attractive to butterflies, bees and other pollinators. Like the flowers, the leaves of Sedum vary greatly according to species. Shapes range from bean shaped to spatulate with a rosette growth pattern. Foliage colors may range from light green to red to purple. Some plants have solid green foliage, and some are variegated. Some change colors with the seasons or in response to environmental stimuli. Depending upon the variety, Sedum does best in full sun to partial shade. Many succulent sedum varieties are amazingly frost tolerant and will reappear every spring, even after long winters covered by snow. Sedum tolerates a wide range of temperatures and is hardy in the United States from USDA hardiness zones 3 through 9. Be sure to check the needs of the individual plant selected, before leaving it outdoors through a snowy winter. When kept as a houseplant in the wintertime, keep temperatures high and consistent. When temperatures drop below 50°degrees Fahrenheit indoors, plants start to go dormant. Keep indoor Sedums in a sunny window or under artificial lights at temperatures between 60° and 70° degrees Fahrenheit through the winter. Because these plants are drought tolerant succulents, they prefer deep, infrequent watering. Established plants may not require watering at all. Be sure to check on the plants often to make certain they do not become too dry between waterings. When you do water, use a soaker hose or other method of deep, ground watering. Avoid getting the leaves, stems, and flowers wet. As long as you plant Sedum in a quality soil amended with a good supply of organic compost, fertilizing may not be required. At the end of the growing season when Sedum dies back, mulch over the area with a rich, organic compost. The compost will feed the soil and protect the plants through the winter. When you grow sedum plants in containers, fertilize using a weak solution designed for cactus or succulents. As long the plants are divided annually and provided with fresh soil fertilizing is not necessary. Too much fertilizer is far worse on Sedum plants than no fertilizer at all. Sedum plants are commonly called Stonecrop because they don’t need rich soil to survive. Some sedums can grow between stones or in gravel. Even so, if you’re keeping Sedum as a garden plant or houseplant, give it soil to help it to do its best. In the garden, be sure the soil is light and well draining. Work in organic, compost matter, coarse sand and/or fine gravel as needed to provide a light, well-drained soil. When kept as a houseplant, use a prepared cactus or succulent mix or make your own potting soil, combining coarse sand and/or coco coir. Once plants become established, they will not need much care. Prune as necessary to maintain or prevent unwanted spread. Plants may be divided in the spring or in the autumn to help control their spread. Deadheading does not promote blooms, so enjoy the flowers as they appear. Pinch off dead blossoms as you wish. When plants finish flowering, cut them back to maintain the shape you desire. When they fade trim them back. You have many options when planting Sedum. These succulents can be grown from seed or cuttings or by division. Seeds may be sown directly in average to rich, well-drained garden soil early in the spring. Keep the soil evenly moist. The seed should germinate within a couple of weeks. As the seedlings grow, thin out the weaker individuals. Thinning provides more growing space of 6″ inches to 2′ feet per plant for the stronger individuals. When growing from divisions, divide the parent plant into two or more sections. Whether planting in a container or the garden, be sure the top of the root ball is level with the surface of the soil. Propagating Sedum from cuttings couldn’t be easier. Start cuttings at any time throughout the growing season. Just poke a hole in garden or container soil and insert the cut end of a bare stem. A good cutting for rooting is clear of leaves on the bottom couple of inches with 2-4 healthy leaves on the top. Keep the soil evenly moist, and the cutting should put out roots and begin to flourish within a matter of days. Outdoors, creeping sedums will set down roots on its own. Look closely at the plant and locate sections that have started to grow roots. Carefully cut these sections free and replant them in a container or a new location as you wish. If over watered or overcrowded, Sedum may be subject to infestation by scale insects and/or mealybugs. Slugs and snails may also be problematic outdoors. As with all succulents, overwatering, overcrowding and lack of good air circulation can lead to root and stem rot. To avoid these problems, be sure to give your plants plenty of space to grow and spread. Use an appropriate pesticide to deal with mealybugs and scale insects indoors. Outdoors, encourage natural predators, such as ladybugs and lacewings. Pickoff slugs and snails by hand. Thin plants to reduce hiding places and improve air circulation. Reduce watering to make the environment less welcoming to slugs and snails. Crushed eggshells and/or diatomaceous earth sprinkled on the ground around affected plants may discourage these gastropods. Is Sedum Considered Toxic or Poisonous To People, Kids, Pets? For the most part, Sedum is edible and quite tasty. One exception, Sedum rubrotinctum, (aka: Jelly-Beans or Pork and Beans) is a hybrid and not a true Sedum. Its leaves are poisonous, and its sap may cause skin irritation. Is Easy To Grow Sedum Considered Invasive? The plant spreads rapidly and could, conceivably, be considered invasive in just the right setting. However, it is not officially considered invasive at this time. For the most part, Sedum is happy whenever it grows in full sun, loamy, sandy soil. This hardy, attractive plant does well in the garden, in containers or as a houseplant. When outdoors, it draws butterflies and other pollinators. The best use of these succulents depends upon the variety you choose. With so many varieties available, select the ones suitable for your application. Low growing Sedum does very well as a groundcover and makes a great addition to xeriscaping and rock gardens. Creeping varieties are also a good choice for filling in cracks between past pavers or rambling alongside footpaths. Rambling varieties, such as Donkey’s Tail, make great succulent hanging baskets. Tall sedum varieties do well as back borders in flower gardens. Some sedum types are good for use as cut flowers. Sedum blood stonecrop or Voodoo is a native of Eastern Europe. This trailing plant produces compact, colorful rosettes in shades ranging from deep, burgundy red to variegations in pink, white and green. The Spanish Sedum Stonecrop does very well planted between rocks and pavers. Its medium green leaves are small and needle-like, and the quickly spreading plant reaching a maximum height of only a couple of inches. 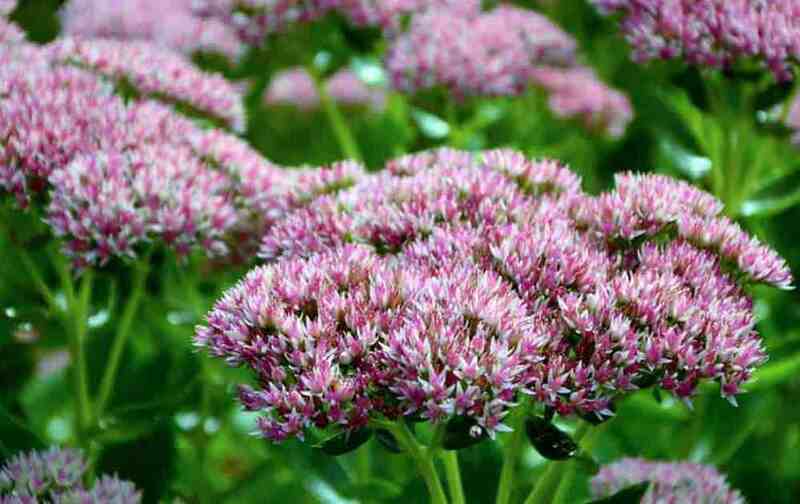 The reflexum sedum is another good, low growing choice. This variety also has pretty yellow flowers, with bluish green foliage resembling that of the spruce tree. Pachyclados presents great bunches of tiny rosettes in a pretty shade of gray-green. Flowers are like tiny white stars. A drought tolerant plant great for use as a groundcover in full sun to partial shade and needs very little water. The burro’s tail is a native of Mexico. This plant is an excellent choice for a hanging basket. The “Burro’s tails” can grow to be as long as 4′ feet in a period of six to eight years. This plant is sensitive to frost and does best in warmer climates and indoors. The sieboldii Sedum is an attractive small, sedum with a low, spreading growth habit. Sieboldii grows in circular mounds sending out horizontal branches from a center crown. The leaves are about 3/4″ inches around and blue-green growing in sets of three. Deep pink leaf edgings, intensify as the season progresses. Fall leaf colors of pink, yellow, orange or bright red depending on light intensity. The tricolor stonecrop is a good choice as a ground cover. The plant has light green leaves with white edging tinged with pink. The pink blossoms are attractive to butterflies but resist deer and rabbits. Pork and Beans is a sprawling plant with fat, red, bean-like succulent leaves providing lots of attractive color. It’s a good choice for a rock garden. Plant in areas where pets and children will not tamper with it. Cape Blanco is an excellent sedum for coastal gardens. It is a native of the coasts of California and does very well in poor soil. It grows in compact rosettes of silvery blue-green leaves. Sedum Angelia displays pretty yellow flower heads on blue-green leaves. This plant is exceptionally tolerant of drought conditions and a good choice for covering large spaces when xeriscaping. Sedum Autumn Joy is a beautiful, upright variety that does well as a back border or in containers. The plant grows to be approximately two feet high with pretty green leaves and showy pink blooms. Purple emperor is an excellent choice if you want year-round interest in your garden. The flowers are an attractive dusty pink, and the leaves a deep shade of burgundy. The plant grows about a foot high. Telephium is an upright species with a height of about two feet and a spread of one to two feet. Leaves range in color from medium green to deep burgundy. Purplish/pink flowers are a nice addition to a bouquet. The flowers are starlike and usually small but with large clusters. Smaller sedums provide texture, color and make lovely additions to rock gardens or planted as ground covers. The post Sedum Plant Care: Learn How To Grow Stonecrop Plants appeared first on Plant Care Today.